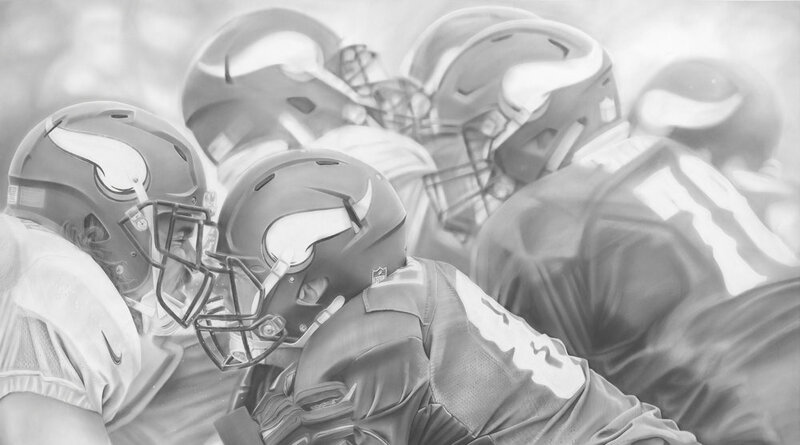 "Game Ball", Graphite on paper, 50 x 90 inches. Commission for the Minnesota Vikings TCO Performance Center. 2018. "50 Yard Line", Graphite on paper, 50 x 90 inches. Commission for the Minnesota Vikings TCO Performance Center. 2018. "Training Camp", Graphite on paper, 50 x 90 inches. Commission for the Minnesota Vikings TCO Performance Center. 2018. Gjallarhorn (Skol), Graphite on paper, 50 x 90 inches. Commission for the Minnesota Vikings US Bank Stadium. 2016. "Viking Strong" and "Sled (Push It)", Graphite on paper, 30 x 30 inches each. Commission for the Minnesota Vikings TCO Performance Center. 2018. "Papa Beard", Graphite on paper, 50 x 38 inches. 2017. Installation at Fair State Brewing and limited edition bottle release. "Defenders of the Line", Graphite on paper, 44 x 66 inches. Commission for Lambeau Field Art Collection. 2017. Honor a loved one. Invest in a custom graphite drawing and preserve a memory forever. "Charma", Graphite on paper, 11 x 11 inches, 2011.